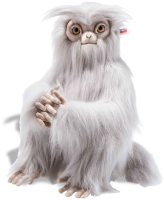 "Wonderful famous J.K. Rowling Character"
Steiff Hedwig Owl is from HARRY POTTER - how amazing! Hedwig is Harry's devoted pet Snowy Owl and delivers any post to Harry. 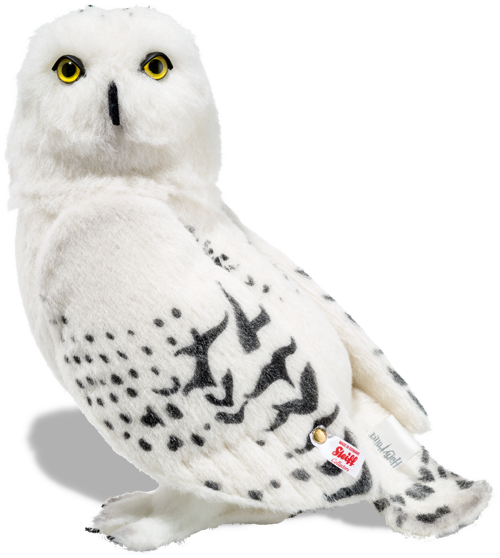 Steiff bear have made Hedwig who is highly intelligent, extremely loyal and has an impeccable internal compass. Her favourite things to do include hunting, flying, and she is been known to affectionately nibble Harry's ear. She is magnificantly made from high quality white alpaca which has been hair brushed with black markings and is 1-way jointed so you can move her face to look at you from different ways. And just look at her face and you will see impressive eyes in yellow and black which have highlighted with black - together with a long black nose. She has two elegant wings - and Steiff have given the world famous Steiff button on one of them. Limited edition of just 1,500 pieces - we do suggest ordering early as we are sure this famous Owl from HARRY POTTER will be highly treasured. Famous teddy bear - Steiff - who make lovely animals.